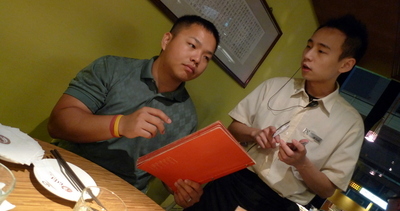 This last trip to Taipei marked my third time dining at Kiki Restaurant. Despite being owned by a celebrity (usually a black mark) and having multiple branches (often tough to maintain quality), Kiki Restaurant serves very good Szechuan-inspired food in a pleasant setting with attentive service. Each of my visits has been to the branch on Fuxing South Road in the Zhongshan District. 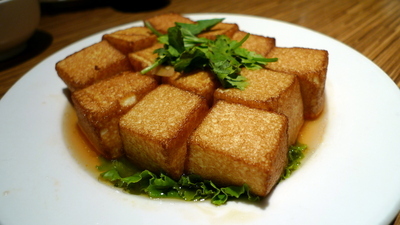 Crispy deep-fried egg tofu. Egg tofu is literally a type of tofu that has eggs incorporated before the soy milk is coagulated. When fried, the inside has a creamy, custard-like texture that is very pleasant to eat. This dish was not oily at all and was a very enjoyable start to the meal. The second dish was a marinated chicken dish. While the chicken is cooked, the dish is served cold. This is a bit of an acquired taste for some people as the chicken skin has a texture that might be described as “rubbery but not chewy”. The flavor is excellent – Taiwanese chickens are the most flavorful I have eaten anywhere. 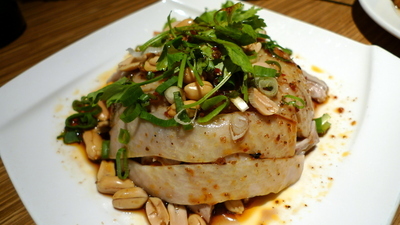 The seasoning was chili oil, peanuts, and green onions. 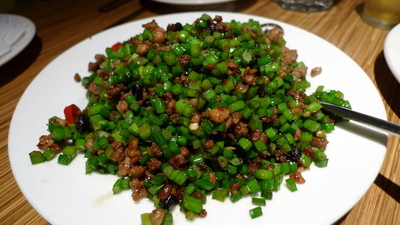 The third dish was stir fried minced pork with Chinese chives and fermented black beans. This was a fantastic dish, lots of umami thanks to the black beans. Visually, it is eye-catching, too! 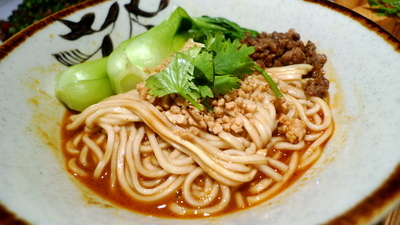 Our fourth dish was Szechuan style spicy noodles with minced pork, also known as “dan dan noodles”. Made with Szechuan peppercorns as well as chilies, this dish gently numbs the tongue while also setting it on fire. The key to this dish is to achieve the right balance. Too many of the peppercorns and your tongue ends up useless. 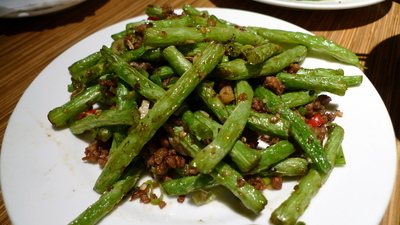 What might be one of the most popular Szechuan dishes worldwide, four season beans with minced pork and Chinese spices. Cooked in a blazing hot wok, the beans are seared quickly, locking in their flavor and freshness. 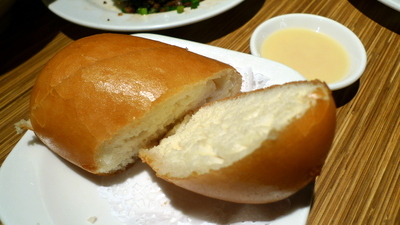 We also consumed several orders of the “home-style” Chinese bread roll, a very simple wheat flour roll served either steamed or deep fried with a side of sweetened condensed milk. Sugi and Tawn both liked the deep fried version. I found it a little oily and preferred the steamed version. As always, we benefitted greatly from Andy (yang1815) handling the ordering. Andy’s good taste and enthusiasm for food is infectious and makes traveling with him a blast. This entry was posted in Uncategorized and tagged Chinese, Dining, food, KiKi, Restaurant, Sichuan, Szechuan, Taipei, Taiwan by christao408. Bookmark the permalink. I’m thinking it is nearly 3.5 hours until lunch and my salivary glands just kicked into hyper drive. This looks very good – I’m thinking I’d pass on the dan dan noodles (pretty sure even my little purple pill couldn’t save me) but the third dish looks soo good! This all looks so good, I would try it all if I could! Glad the food was a tasty as it looks. I would bypass the oily bread too. Actually I usually do not eat bread when dining out. I consider it a filler and I want room for the main courses. Mmm everything here looks so delicious.. I think I could survive off many of them items. They look pretty good. What do you do in Taipei? Black beans and pork are a grand combination, but I think it should be a crime to serve them that way there … I much prefer the version that I grew up with (fair warning: Beware the NC-17 first section behind that link ). That cold marinated chicken looks good, though. Again, there’s a more Cantonese version with scallion-ginger sauce that I’m used to. Excellent representation of the varieties of food. The tofu made me drool. @Fatcat723 – The bread is not complimentary but a classic Chinese pastry. The fried version gives it a crispy crust and more texture. It was unfortunate that we could taste the old oil, it is not usually like that. @n_e_i_l – ah, personal preference, sure. The higher surface area allows more textures and/or flavors to be included in every bite though! These are all very good home cooking dishes. I particularly like that crispy tofu dish! The tofu does look really good. I also don’t hear people describe things as tasting umami. Is it something like tasting savoury? Or is it slightly different? that third dish looks really good. Just need a nice bowl of white rice to go with it! Did you outsource the comment responses to Andy? hahahaha…..I like Sheldon’s suggestion – the 3rd dish with a heaping bowl of rice. p.s. that waiter caught my eye. szechuan, you say? way too spicy for my liking. but they do tend to be flavorful. I had enjoyed your documentary style post. thanks for shared. I’ll looking for all of these dish on my visit to TAIWAN on October with my family. It’s difficult to find the restaurant? The restaurant is easy to find, located a short walking distance from the Da-An metro station. You can search for it on Google Maps and find it easily. Thanks you very much for your reply, it’s make me feel good from asked you a silly question.